Hot Brown Sandwich, sometimes know as a Kentucky Brown, is an open-faced turkey sandwich with turkey, bacon, pimientos, and a delicate Mornay sauce. The sandwich is place under the broiler to melt the cheese. Kentucky is know for more than the Kentucky Derby, it is also famous for the classic Hot Brown Sandwich. It is said that the hotel restaurant sells more than 800 of these delicious sandwich each week during the regular season. During the Kentucky Derby, held in May each year, that number increases to around 1,200 Hot Brown Sandwiches. Now that’s a lot of sandwiches! 1926 – Chef Fred K. Schmidt at the Camberley Hotel in Louisville, Kentucky, created the Hot Brown Sandwich in 1926. In the 1920s, the Brown Hotel drew over 1,200 guests each evening for its dinner dance. The band would play until late, and when the band took bread, around midnight; people would retire to the restaurant for a bite to eat. 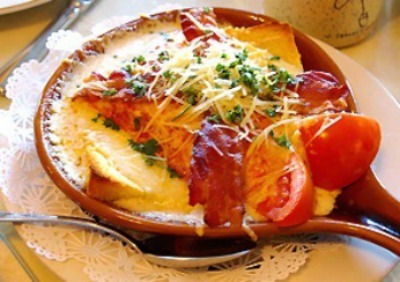 Bored with the traditional ham and eggs, Chef Schmidt, delighted his guests by creating the Hot Brown. In a large saucepan over medium heat, melt butter. Gradually add flour, stirring constantly, until smooth and free from lumps. Gradually stir in milk until sauce comes to a gentle boil, stirring constantly; remove from heat. Add cheese and stir until melted and well blended. In a small bowl, beat egg. Gradually add 1 cup of hot sauce, 1/3 cup at a time, to the egg, stirring constantly. Gradually add egg mixture to remaining sauce, stirring constantly until well blended; add salt and pepper to taste. Fold in whipped cream. To Serve: For each Hot Brown sandwich, place two slices of toasted bread on a metal (or flameproof) dish. Cover the toast with a liberal amount of turkey. Pour a generous amount of sauce over the turkey. Sprinkle with additional Parmesan cheese. 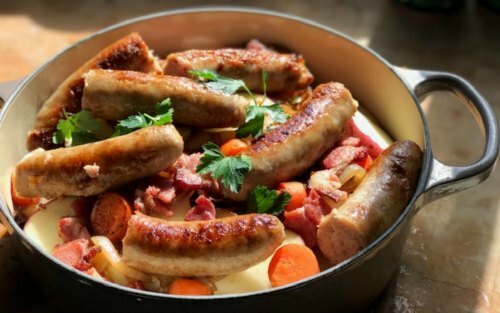 Place entire dish under a broiler, approximately 4 to 5 minutes or until the sauce is speckled brown and bubbly. Remove from broiler, sprinkle with diced pimientos, cross two pieces of bacon over the top, and serve immediately. NOTE: This sandwich is best eaten with a knife and fork so that you get a piece of each ingredient in every bite. Source: Photos and recipe courtesy of the Camberley Brown Hotel in Louisville, Kentucky.